Carbon nanotubes (CNTs) belong to the most exciting objects of the nanoworld. Typically, around 1 nm in diameter and several microns long, these cylindrically shaped carbon-based structures exhibit a number of exceptional mechanical, electrical and optical characteristics . In particular, they are promising ultra-small light sources for the next generation of optoelectronic devices, where electrical components are interconnected with photonic circuits. Few years ago, we demonstrated that electically driven CNTs can serve as waveguide-integrated light sources . Progress in the field of nanotube sorting, dielectrophoretical site-selective deposition and efficient light coupling into underlying substrate has made CNTs suitable for wafer-scale fabrication of active hybrid nanophotonic devices [2,3]. Recently we presented a nanotube-based waveguide integrated light emitters with tailored, exceptionally narrow emission-linewidths and short response times . This allows conversion of electrical signals into well-defined optical signals directly within an optical waveguide, as required for future on-chip optical communication. Schematics and realization of this device is shown in Figure 1. The devices were manufactured by etching a photonic crystal waveguide into a dielectric layer following electron beam lithography. Photonic crystals are nanostructures that are also used by butterflies to give the impression of color on their wings. The same principle has been used in this study to select the color of light emitted by the CNT. The precise dimensions of the structure were numerically simulated to tailor the properties of the final device. Metallic contacts in the vicinity to the waveguide were fabricated to provide electrical access to CNT emitters. 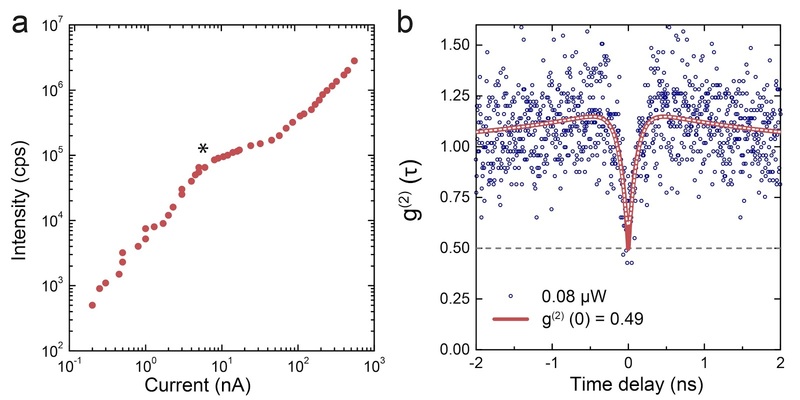 Finally, CNTs, sorted by structural and electronic properties, were deposited from a solution across the waveguide using dielectrophoresis, which is an electric-field-assisted deposition technique. Figure 1: (a) Schematic view of the multilayer device structure consisting of two electrodes (yellow) and a photonic waveguide (purple) that is etched into the Si3N4 layer. Its central part is underetched into the SiO2 layer to a depth of 1.5 µm and photonic crystal holes are formed. The carbon nanotube bridges the electrodes on top of the waveguide. (b,c) False colored scanning electron microscope images of the device. The figure is adapted from Reference . The functionality of the device was verified with optical microscopy and spectroscopy, which allowed detection of light emitted by the CNT and also of the light coupled into the waveguide. An electrically biased CNT generates photons, which efficiently couple into the photonic crystal waveguide, as shown in Figure 2a. The emitted light propagates along the waveguide and is then coupled out again using on-chip grating couplers. Because of the photonic crystal the emission spectrum of the CNT is extremely sharp (Figure 2b) and the emission wavelength can be tailored by our manufacturing process. In addition, the nanotube responds very quickly to electrical signals and hence acts as a transducer for generating optical pulses in the GHz range (Figure 2c). The modulation rates of these CNT-based transducers can in principle be pushed to much higher frequencies up to 100 GHz using more advanced nanostructures. Figure 2: (click on the image to view with higher resolution) CCD camera image of the electrically biased device. Light emission is observed from the nanotube and from the on-chip grating couplers, both connected with the emitter via the waveguide. (b) Emission spectra simultaneously measured at the grating coupler. (c) A sequence of the driving electrical pulses as well as the recorded waveguided emission pulses (red) in GHz frequency range. The figure is adapted from Reference . Nanophotonic circuits are promising candidates for next-generation computing devices where electronic components are interconnected optically with nanophotonic waveguides. The move to optical information exchange, which is already routinely done in our everyday life using optical fibers, also holds enormous benefit when going to microscopic dimensions – as found on a chip. Essential elements for such opto-electronic devices are nanoscale light emitters which are able to convert fast electrical signals into short optical pulses. Using such ultrafast transducers will allow for reducing power requirements and eventually speed up current data rates. For achieving ultimately compact devices the emitter should be as small as possible and interface efficiently with sub-wavelength optical devices. It would also have to operate at a chosen design wavelength and at high speed. CNTs integrated into a photonic crystal nanobeam waveguides fulfill these requirements and constitute a promising new class of transducers for on-chip photonic circuits. These novel emitters are particularly interesting because of their simplicity. In contrast to conventional laser sources, CNTs are made entirely from carbon, which is available in abundance and does not require expensive fabrication routines as needed for III-V technologies. Moreover, CNTs can also be readily combined with existing CMOS technology, which makes them attractive for a wide range of applications. So far we spoke about traditional computers based on binary logic. Going beyond classical computation, quantum computers that exploit the enormous potential of quantum mechanics for complex calculations and cryptography hold promise to revolutionize current information processing approaches. Optical quantum systems that employ single photons to realize quantum bits (qubits) belong to the prominent candidates for such future quantum information processing systems. To build a photonic quantum computer, sources of single photons (e.g. single molecules, quantum dots and semiconducting CNTs ), optical quantum gates and single photon detectors are needed. These devices are capable of very fast and reliable emission and detection of distinct photons. An experimental approach, which allows for showing that a light source emits one photon at a time, consists of measuring intensity correlations in the emitted light. We performed this experiment on a solid silicon-based chip with an electrically driven CNT -- actings as a non-classical light source, waveguides, and two detectors for single photons . The nanophotonic circuit shown in Figure 3 includes these three components: a CNT, a dielectric waveguide for the low-loss light propagation and a pair of superconducting nanowires for the efficient detection of light. A single chip carries dozens of such photonic circuits. The device fabrication process was similar to the realization of photonic crystal waveguides, except that now travelling-wave nanowire detectors were also formed on top of the waveguide. Figure 3: (click on the image to view with higher resolution) (a,b) Schematics and optical image of device with an electrically driven light emitting nanotube in the middle (E) and single-photon superconducting NbN-detectors at the ends (D) of waveguide. The figure is adapted from Reference . The functionality of the device was verified at cryogenic conditions with a setup which allowed the ultra-fast detection of light that was emitted by the CNT and then coupled into the waveguide. 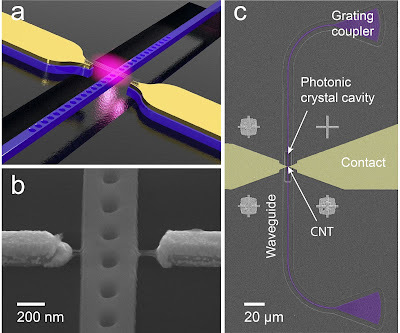 An electrically biased semiconducting CNT generates single photons, which can propagate bidirectionally within the waveguide towards the highly sensitive detectors. The intensity of the emitted light was measured as a function of the electrical bias current through the nanotube (Figure 4a). If only one photon at a time is emitted, the simultaneous detection of two photons with both detectors is highly unlikely. This can be derived from the dip in the second-order correlation function shown in Figure 4b. The low probability of simultaneous many-photon detection underlines the non-classical nature of the light source, which is the first step towards a true single-photon emitter. In essence, we thus realized a fully-integrated quantum photonic circuit with a single photon source and detectors, both of which are electrically driven and scalable. Figure 4: (a) Measurement of the CNT emission intensity in dependence of bias current. Within the marked region semiconducting CNTs reveal non-classical emitting properties. (b) A measured second order correlation function. The minimum value significantly below unity represents the low possibility for simultaneous emission of two photons. The figure is adapted from Reference . Phaedon Avouris, Marcus Freitag, Vasili Perebeinos, "Carbon-Nanotube Photonics and Optoelectronics", Nature Photonics, 2, 341-350 (2008). Abstract. Svetlana Khasminskaya, Felix Pyatkov, Benjamin S. Flavel, Wolfram H. P. Pernice, Ralph Krupke ,"Waveguide-Integrated Light-Emitting Carbon Nanotubes", Advanced Materials, 26, 3465-3472 (2014). Abstract. Randy G. Fechner, Felix Pyatkov, Svetlana Khasminskaya, Benjamin S. Flavel, Ralph Krupke, Wolfram H. P. Pernice, "Directional Couplers with Integrated Carbon Nanotube Incandescent Light Emitters", Optics Express, 24, 966-974 (2016). Abstract. Felix Pyatkov, Valentin Fütterling, Svetlana Khasminskaya, Benjamin S. Flavel, Frank Hennrich, Manfred M. Kappes, Ralph Krupke, Wolfram H. P. Pernice, "Cavity-Enhanced Light Emission from Electrically Driven Carbon Nanotubes", Nature Photonics, 10, 420-427 (2016). Abstract. 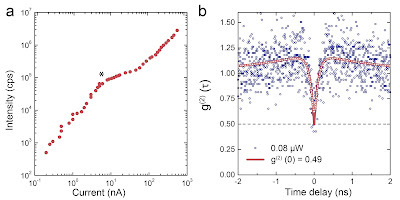 Alexander Högele, Christophe Galland, Martin Winger, Atac Imamoğlu, "Photon Antibunching in the Photoluminescence Spectra of a Single Carbon Nanotube", Physical Review Letters, 100, 217401 (2008). Abstract. 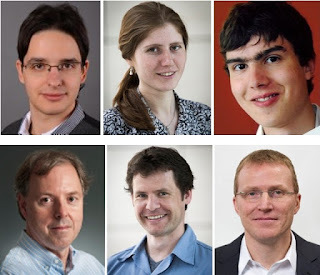 Svetlana Khasminskaya, Felix Pyatkov, Karolina Słowik, Simone Ferrari, Oliver Kahl, Vadim Kovalyuk, Patrik Rath, Andreas Vetter, Frank Hennrich, Manfred M. Kappes, Gregory N. Gol’tsman, Alexander Korneev, Carsten Rockstuhl, Ralph Krupke, Wolfram H.P. Pernice "Fully Integrated Quantum Photonic Circuit with an Electrically Driven Light Source", Nature Photonics (2016). Abstract.